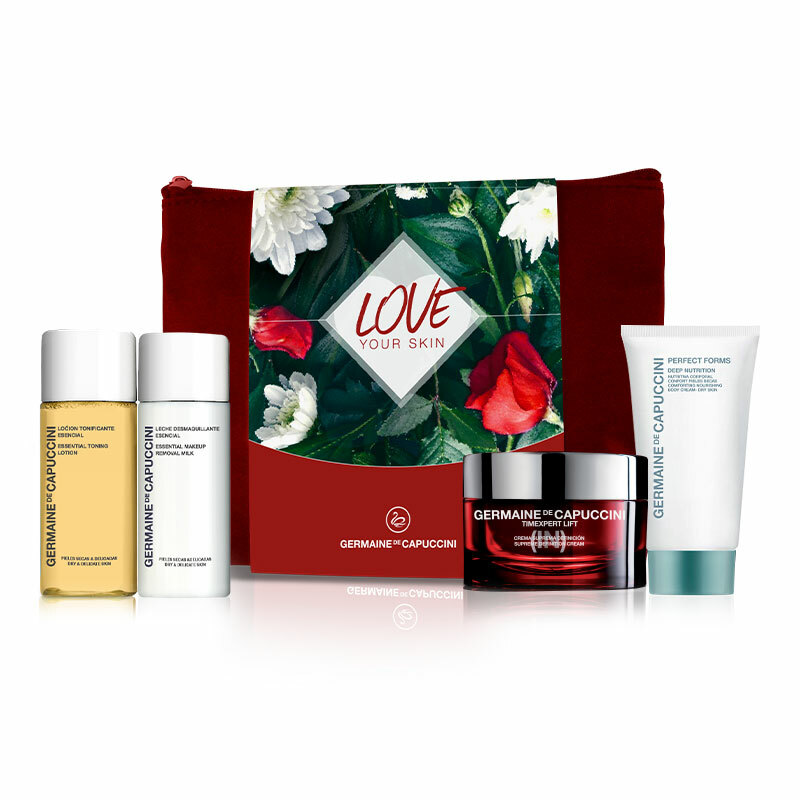 A limited edition gift set contains a selection of travel sized products in a Germaine de Capuccini red bag. This beautiful set is the perfect gift for her - on any occasion. Containing a handpicked selection of soothing products to hydrate, protect and firm the skin in a limited edition Germaine de Capuccini red beauty bag. Essential Makeup Removal Milk (50ml) This gentle cleanser is perfect for normal, dry or delicate skin. Containing Porcelain Flower and Globe Daisy Extract it removes makeup and impurities whist protecting, soothing and rejuvenating the skin. Essential Toning Lotion (50ml) This gentle toner is perfect for normal, dry and delicate skin. High molecular weight Hyaluronic Acid maintains natural hydration whilst flower extracts soothe and balance the skin. Supreme Definition Cream (15ml) This advanced cream works to restructure the skin’s support matrix to redefine the facial contour whilst providing intense hydration. Deep Nutrition (20ml) This rich cream contains Shea Butter and Almond oil to repair and protect dry and damaged skin affected by dehydration.